It maybe difficult for you to go to gym in rainy days,it takes more time,more energy.maybe you are also ashamed of your body in front of people. But it's not the excuse anymore today, Karmas Indoor Bike Trainer is perfect for you to exercise indoor, it fit for any road or mountain bike with a 26-27" or 700c wheel.This trainer can be assembled within just few Minutes,it can also be folded to an ultra compact size.Magnetic resistance can be adjusted to allows for multiple levels of intensity. with noise reduction resistance wheel,you don't need to worry if it will disturb other's rest during exercise. Built with a wide base and heavy duty steel frame can easily support regular exercise. Noise reduction resistance wheel means it won't disturb others during exercising. 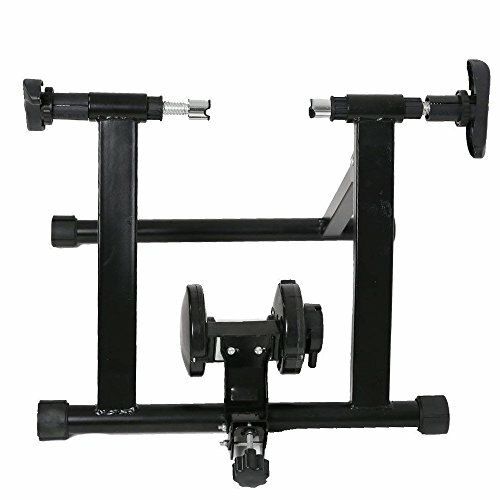 The Indoor Bike Trainer Stand fits road or mountain bike with a 26-27" or 700c wheel. If you have any questions about this product by KARMAS PRODUCT, contact us by completing and submitting the form below. If you are looking for a specif part number, please include it with your message.